I don’t know where the name comes from and why it was chosen, all I can say is we look like towel boyz and dolls. 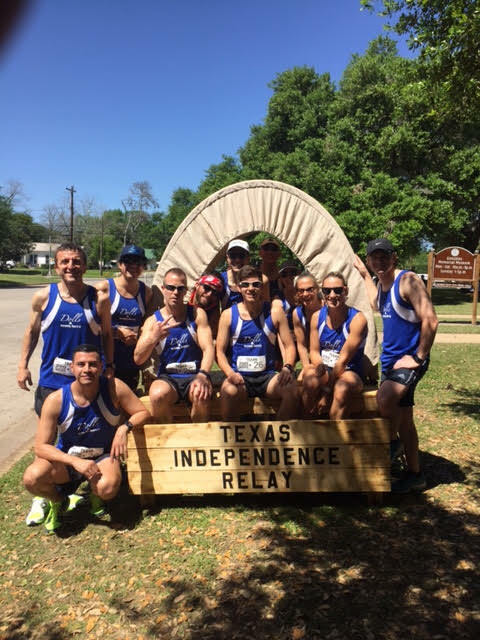 Team DnTB is a group of 12 runners which whom take on the Texas Independence Relay ( TIR ) every year. This year I was one of the chosen ones to take part in this great event with this great team. I had run, seen or heard about the runners in the DnTB but never participated in a relay with great runners like the ones in our team. I was privilege to share quality time with them. We often run against each other and participate as individuals, this time we came together to try and get the win. I don’t know the process in which I was chosen to part take in the team, but I’m glad I was asked to participate. It is nice to hear them talk about running in another level than me. Whether they were talking about pace/training/eating/improvement it was great to hear. As many of you know, I don’t really keep track on my distance or speed. Many of them use Strava to track their progress ( I have an account, but don’t use it ). The TIR had over 200 teams participating, they started in waves from 6:00 a.m. to 2:30 pm. We were the last team to start at 2:30 so we could catch up with the earlier runners. We started 10 minutes away from the Road Runners team from Corpus Cristy, they were totally trying to intimidate us and even saying something like “They don’t look fast”, so little did they know that by leg 10 we had caught up with them. Then around 9:00 p.m. we passed them, by about 2 minutes. Then it was all down hill for them, we establish a great lead between them and after I came back out from taking a break, I didn’t hear or see anything from them. We were having fun, while being awesome in doing something we love and do as individuals. We heard from the other van that one of our team members had an issue with his tooth and will have to re arrange the legs because he could not go any further. I don’t think I could have done another leg, but I would have if I had to. Thankfully Liz stepped up and took the leg. Then Craig re-organized the leg structure and we were set. We continue throughout the night running and we all helped with supporting the runners. It was around 9:00 a.m. when I realized we were in down town Houston, I was shocked that I didn’t even feel we had traveled that long. So, after that realization I had to prepare for my last leg, I had only a 2:59 mile run and was planning to run it fast. I started at 6:00 minute for the first mile then 6:20 and I was done! with my last leg. WoooHoooo! ooohhh cramp, cramp! I started to cramp when I was in the van. So, my legs were done! We got to the San Jacinto monument and that looked unreal. I even asked, what place are we on? Craig said, we took first! Whaaat! first place! but I only passed 19 people! Again, this was a lot of fun and the littlest of help each member did was the effort to get the win in 20 hours 34 minutes almost 2 hours away from 2nd place. ps. the member with the broken tooth ended up running a great 5+ mile leg!